Join fellow SALA members as we take part in L.A. Pride's Resist March. 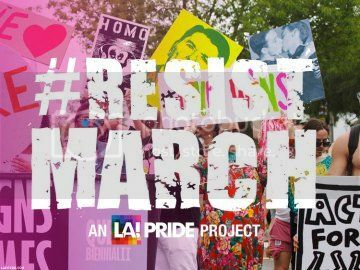 The event will begin at 8 am with speakers at Hollywood & Highland and will be followed by a march to West Hollywood where it will conclude with a rally (and party with Pride!). When any American’s rights are under threat, all our rights are threatened. We are lesbian, gay, bisexual, transgender, and queer. We are people of color. We are people of different faiths. We are people of all genders and no gender. We are immigrants. We are dreamers. We are people with disabilities. We are parents. We are allies. And we are beautiful intersections of these. But most of all, we are American. Yet our rights are in jeopardy. Forces are gathering in government that intend to take away our hard-won basic human rights. We are calling on everyone to peacefully march with us on June 11th from Hollywood and Highland to West Hollywood. Instead of a Pride Parade meant to celebrate our past progress, we are going to march to ensure all our futures. Just as we did in 1970's first LGBTQ+ Pride, we are going to march in unity with those who believe that America's strength is its diversity. Not just LGBTQ+ people but all Americans and dreamers will be wrapped in the Rainbow Flag and our unique, diverse, intersectional voices will come together in one harmonized proclamation. ​We #RESIST forces that would divide us. The Metro Red Line has a stop at Hollywood/Highlight which makes this easy to get to even with all the street closures. Since this is scheduled to start rather early, I'm planning to meet anyone who is interested in participating in front of the Starbucks next to Madame Tussauds (near the corner of Hollywood Blvd/Orange Dr) at 8 am. We will miss the start of the speakers but we will have plenty of time before the march begins. Please include a cell phone number with your RSVP so we can get in touch on the day!